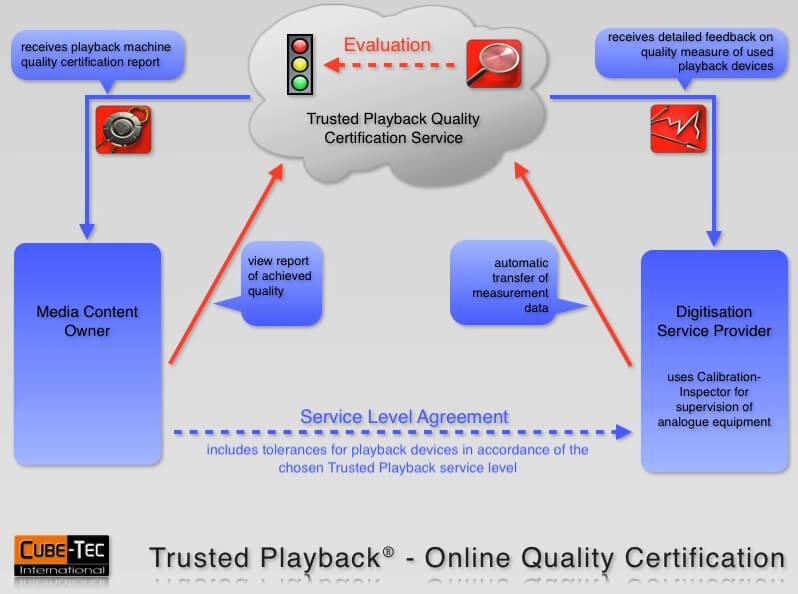 Based on the Calibration-Inspector measurement results, the Trusted Playback online certification service was developed. The service can on the one hand be used for internal quality management. On the other hand it can also become part of contracts between sound carrier owners who are striving for a mass digitization through outsourcing and service providers that offer this digitization service, and then be used as a means for quality surveillance. If, for example, an archive is planning to outsource the digitization of a large tape collection, it is now possible for the first time, through the use of the Calibration-Inspector system, to explicitly define the expected quality of the digitization within the respective service level agreement (SLA). In contrast to general regulations which, for example, regulate the use of certain playback machines or the frequency of maintenance, additional objective aims or tolerances for the measurable audio quality parameters can be defined and efficiently controlled throughout the digitization project. Defining tolerances for a minimal acceptable signal-to-noise ratio or the maximum possible wow & flutter values for reel-to-reel machines ensures a monitoring of parameters which is not possible when using conventional methods. Controlling whether the service provider adheres to the predefined guidelines can be realized through a respective online service. It is necessary, however, to ensure an automatic and safe transfer of the quality measurement data from the service provider to the online service platform. 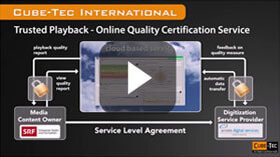 After evaluating the measurement data by reference to the tolerances defined in the service level agreement, a quality certificate for the ingest of recordings within a defined time period is awarded. The frequency of analysis is defined in the service level agreement. As a standard, the measurement has to be completed once a day. In order to simplify the SLA draft, universally applicable descriptions of the service level quality guidelines are available and can be used within the scope of e.g. tenders for digitization outsourcing. Both the archive and the service provider are given an insight into the measurement data of the playback machines in use. By means of a provided web-based quality management system (QMS) within the Trusted Playback service both parties can participate in the controlling process and have the possibility to view detailed reports. The left Picture shows a schematic of the interactions between the outsourcing archive and the digitization service provider. The employment of such an online certification service provides benefits for both parties: archives obtain a quality assurance instrument for the recording of their media. In the past, sound carrier owners had to implement quality control by means of a cost-intensive strategy: multiple recording of a single sound medium and time-consuming comparative analysis. The availability of objective measurement results allows for a drastically simplified quality monitoring. For companies or organizations dealing with the process of mass migration of analog media, long-term evaluation is an important tool for supporting the continuous internal improvement process. For example, slow deterioration over time can be made visible. Besides the cost savings due to precise situation assessment, there is another advantage for service providers: when using playback devices of different quality, it may have been difficult to argue the higher costs for recording with high-quality machines to their client. With help of the automatic, reference-based analysis, quality differences between average and high-class playback devices become easily measurable. By documenting the measurement results, the client can easily see the quality difference between different machines. The SLA guidelines can therefore offer different service levels, thus enabling a quality based pricing system. The adherence to the agreed service level can be proven to the client with the online service. For quality-conscious service providers this opens up new opportunities to set themselves apart from competitors that operate with a less than convincing quality management system.